Have You Found The Easy Button? How much e-mail do you get in a day? Well on my average weekday I may get up to 150 e-mails. Most of these will be people trying to sell me something that will make me money the easy way. Just push the button and the cash will flow forth! Easy, no need to do anything at all, push the button count the cash. If you are like me I’m still waiting for delivery of my luxury liner, my order for my 6 Bentleys seems to have got lost somewhere in the system and I’m struggling to decide which small island paradise to buy. Reality check required, after you have been burned a few times you realise that there is no easy button. There are however ways to make things easier, the real way to make real money in IM is to create your own products. But when you are starting out this maybe appear a daunting task and we are often faced with information overload. But there are ways making starting up a bit easier. WARNING NO SALES PITCH COMING!! My e-mail box is bombarded each day with ‘buy this’, ‘buy that’ and, buy the other’. I could spend several thousands of dollars a day on products that promise instant wealth. 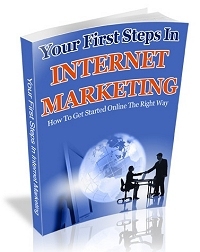 To set up and make a start in IM you only need a hosting account. If you have that you will have almost everything you need. If you do not have a hosting account then I can recommend D9 hosting (see my recommended links) who offer a superb service at excellent rates. If you already have a hosting account you can set up your own blog by downloading Word press for free. You can even have a blog without the hosting package by using blogger.com the problem is that you will never own this blog as it is owned by Google. You can expand by using Freebies from Giveaway Events, now some may frown on this but it is a way of starting without spending your hard earned on products you may not like or may not use. Save your money, you do not need to spend out large amounts to get started. You can obtain scripts, graphic programmes, templates, PLR information, Video and Audio products for a simple sign up to a list. Learn how to use these products, you may find that some do not suit you as your ideas develop, at this stage you can pay for custom made products that fit in to the theme of your business you can even out source the work to others more skilled at these tasks than you. BIG OPPORTUNITY! Earlier this week Mike Filsame made available FREE his Butterfly Marking Script, you may ever have heard of it but I bet you will have seen it action thousands of times. This until recently was a $1995 paid product. This is now available FREE read more about this HERE. Hi Rob, excellent post and so very true. I think your Bentleys may be on the same transporter as my Porsche’s. Last seen circling the M25 looking for the right hand exit, ha ha. Freebies is an excellent way to get the knowledge to enable you to move forward and with the addition of Butterfly Marketing it just got a whole lot better. Hi Barry wonder if I can tap into the M25 web cams at least we will know where they are then! You have just said what so few want to hear! The truth. Even after years (years, mind you!) of being let down by one scheme after another, it can still take me a few hours to recognize when something is too good to be true. That wish and the resulting self deception is so strong, entire political administrations have been built on it. Hi Jen, these days I take a bit of a step back to think before I jump even so its very easy to get taken in. Hi Rob, brilliant post. I want an easy button! Oh, okay, there isn’t one – well, I’ll just carry on doing what I do then. I can see the bricks building that tower of success one by one, that’s what it is all about. It never works for me either John!! How right you are, Rob i myself was chasing the dream on hope to find the easy button, the magic pill and it just isn`t there, the trouble is however by the time most people realise this they have already given up! That dreaded Easy Button. Oh, how much time I have wasted chasing it. That’s been a huge problem in internet marketing for a long time…the hype-filled sales pitches. It’s time to clean the industry up! Thanks for the great post! Loved the advice Rob, everything will be alot more straight forward now! Rob Corrigan is a man who knows what he is talking, a man I would very much like to get to know better.